Although outside of Africa we may not have such a long history of using Shea butter, it is vary much a fixed part of a West African woman’s life and is even said to have been in ancient Egypt’s box of beauty ingredients. Shea butter comes mainly from Western Africa, from a tree known as the shea tree. This tree produces a nut and it is this nut that shea butter comes from. It grows in the semi-arid savannah region of West and East Africa. It is also known as karite butter which in a local language means ‘life’. The great thing about the shea tree is that it needs no special care to grow, no water and just grows wild. It is just labour which is needed to make the butter itself. In Africa, the whole of the tree is used. The bark is used in traditional medicine and the shell of the nut is used as a mosquito repellent. And of course the shea butter itself is used by all Western African women. It is women who are in charge of making shea butter in Africa, where it is known as ‘women’s gold’. Women harvest the nuts and make the butter and it is also women benefit from the sale of shea butter. The shea fruit are crushed and boiled to extract the nuts and then grilled and pounded after which the butter is pressed out with boiling water and left to cool and set. In a more industrial setting the shae butter is extracted by expeller presses. 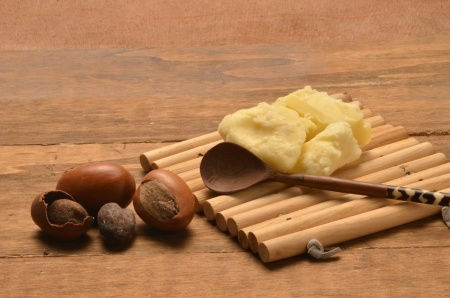 Shea butter is penetrating, nourishing and healing. It is also anti-inflammatory. Because of the unsaponifiables and the fatty acid profile, it really moisturises the skin and is useful for maintaining elasticity. The saponifiable component of the butter lends to the moisturising element of the butter and the unsaponifiable component lends to the healing elements. The unsaponifiable element of a good unrefined shea butter, also called the bioactive fraction, is on average around 5-9% whereas in most other seed oils it is less than 1% (except for avocado which is around 4%). It is this part that includes the bioactive components or the components that benefit human health; vitamins, acids and antioxidants and phytosterols. Mineral oil has no bioactive component, so also no healing elements. Shea butter penetrates the surface and so is a great product for stretch marks. It is high in vitamin A, thus the creamy colour of the unrefined shea butter. It is useful for wound healing, stretch marks (both prevention and healing), eczema, wrinkles, scars, itchiness, cracked and rough skin, sunburn and dry and damaged hair. It is also high in vitamin E, which is useful for its anti-ageing properties, as well as contributing to an improvement in the circulation of the capillaries in the skin. Shea butter is the hero ingredient of body butter.